This entry was posted on February 13, 2011 at 12:40 pm and is filed under Food with tags beef stock cube, chilli con carne, chilli powder, chopped tomatoes, garlic cloves, ground cumin, kidney beans, long grain rice, marjoram, minced beef, onion, paprika, recipe, red pepper, soured cream, sugar, tomato purée. You can follow any responses to this entry through the RSS 2.0 feed. You can leave a response, or trackback from your own site. Zuzana, well spotted. 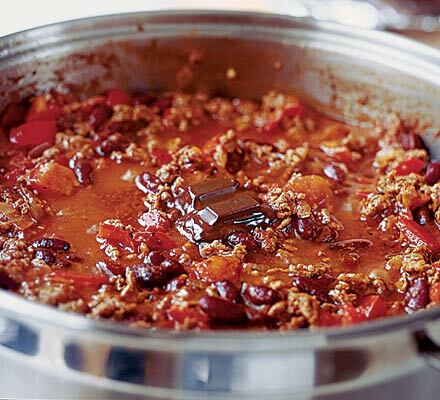 Yes, chocolate and chilli go well together. The Shetland Fudge Company makes a delicious chocolate and chilli and vodka fudge which I first sampled at the Cunningsburgh show up there a couple of years ago. I visit Shetland every summer. It’s important to use good, strong, dark chocolate.